It’s that time of year again. Christmas is closer than you realise, and you still have lots of shopping to do. 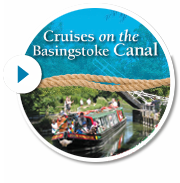 If you cannot think what to give a friend, relative or work colleague for Christmas then consider this: why not give them a voucher towards a boat trip on the Basingstoke Canal next year? The Basingstoke Canal Society runs two trip boats; the 50-seater John Pinkerton II (right, above) in Hampshire and the 12-seater Kitty in Woking (right, below). For more details about our boats and trips, see the John Pinkerton Canal Cruises web page. Note that at the time of writing, details of next year’s trips are still being finalised, but you can still buy the vouchers. Very simply, all the recipient has to do is to click on the Book Your Trip link at some time next year, select the trip of their choice, follow the instructions on the voucher to book, and just insert the voucher number! The cost of the trip will be reduced by up to the value of the voucher. These pages give more details on how to purchase vouchers, and terms and conditions. Upon purchase, you will receive both an email containing details of the voucher (which you can forward to the recipient), and a voucher PDF file which you can print and include in a Christmas card. So, Christmas present problem solved…. Note: Vouchers for the two boats are not interchangeable – they must be used on the boat for which they were purchased.